Research shows that TM is more effective at reducing the symptoms of posttraumatic stress than mindfulness meditation. 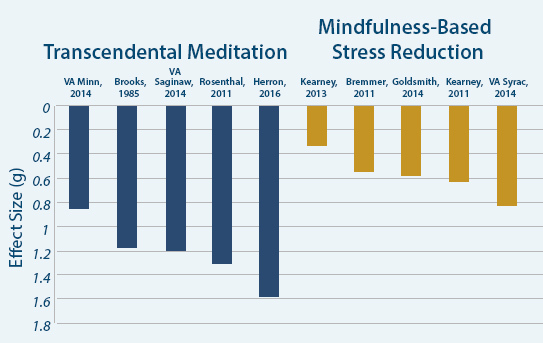 Brooks JS, Scarano T. Transcendental Meditation and the treatment of post-Vietnam adjustment. Journal of Counseling and Development. 1985; 64:212-5. Rosenthal J, Grosswald S, Ross R, Rosenthal N. Effects of Transcendental Meditation (TM) in Veterans of Operation Enduring Freedom (OEF) and Operation Iraqi Freedom (OIF) with Posttraumatic Stress Disorder (PTSD): a Pilot Study. Military Medicine. 2011; 176(6):626. Kearney DJ, McDermott K, Malte C, Martinez M, Simpson TL. Association of participation in a mindfulness program with measures of PTSD, depression and quality of life in a veteran sample. Journal of Clinical Psychology. 2012; 68(1):1-16. Kearney DJ, McDermott K, Malte C, Martinez M, Simpson TL. Effects of participation in a mindfulness program for veterans with posttraumatic stress disorder: A randomized controlled pilot study. Journal of Clinical Psychology. 2013; 69(1):14-27. Goldsmith RE, Gerhart JI, Chesney SA, Burns JW, Kleinman B, Hood MM. Mindfulness-Based Stress Reduction for Posttraumatic Stress Symptoms: Building Acceptance and Decreasing Shame. Journal of Evidence-Based Complementary & Alternative Medicine. 2014; 19(4):227-34. Bremner JD, Afzal N, Vaccarino V, Carmody J, DiVitale S. Mindfulness Based Stress Reduction in the Treatment of Iraq Combat-Related PTSD. American Psychosomatic Society Conference; San Antonio, Texas, 2011.